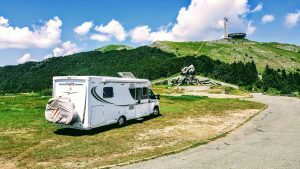 After the relative safety of our travels through western Europe last year, where we cut our teeth and built our confidence, it seemed the right time to venture further afield. 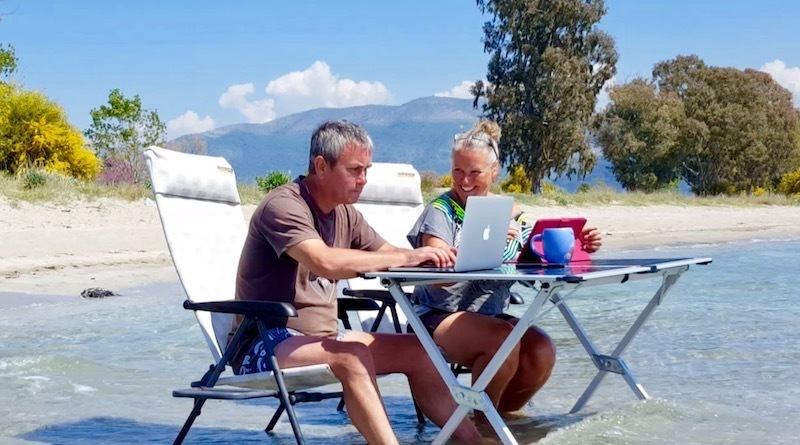 And ‘Greece was the word… that we were hearing.’ What a great leg our Greek Odyssey was, opening our eyes to this amazing southern European jewel. With eager eyes – and leaky eyes, it has to be said, as corner after corner of luscious, sparkling and generous spirit caught hold of our souls. Surely this was the pinnacle? 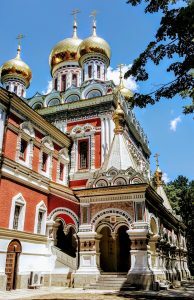 Although thankfully, very quickly into our nomadic travels, we learnt not to judge one place against another, as the world is so amazing, diverse and unique, that to compare is to dishonour. So we have learnt to be in the moment and fully appreciate all we are experiencing without too much comparison. 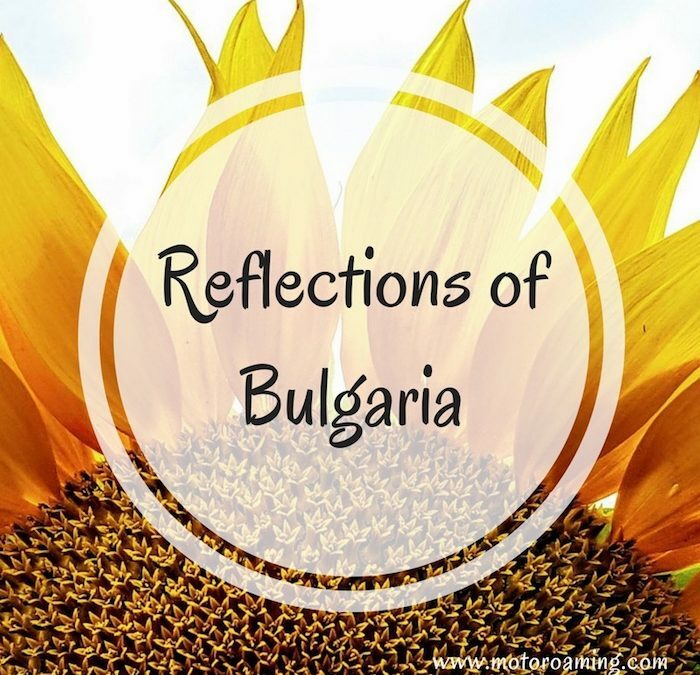 Although leaving Greece with a huge basket of mind-blowing memories left us wary about how we would feel about Bulgaria, which was totally new to us. Would we fall in love with this too, or would there be some disappointment after such a great Greek tour? 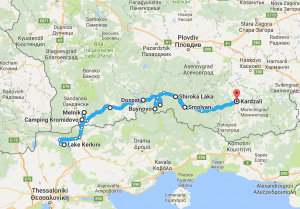 Well our worries were soon allayed after a really easy border crossing, just north of Serres. Within 20 minutes we had passed through Border Control, changed our Euros to Lev (at a rate of 1.84) and bought our vignette for €20. We were ready to go. 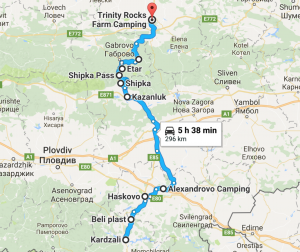 With nervous anticipation of potholed roads, that many had warned us about, we headed to Camping Kromidovo. And the roads were actually great until we approach the campsite’s village where it became tricky to say the least. So a beautiful little campsite awaited us, greeted by English couple, John and Sarah, (41.454485 23.362855). A little retreat here was just what we needed as we allowed ourselves to decloak from Greece and ground ourselves into our new country home. 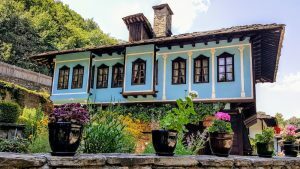 A cycle to Melnik was our very first outing and as we glided down hills and climbed up ridges, we soon got a very good flavour of Bulgaria landscape and culture. People us gave toothy smiles and friendly waves, cars hooted warmly as they passed us with care and wild pigs, donkeys and wildlife galore fringed the roadside edges. 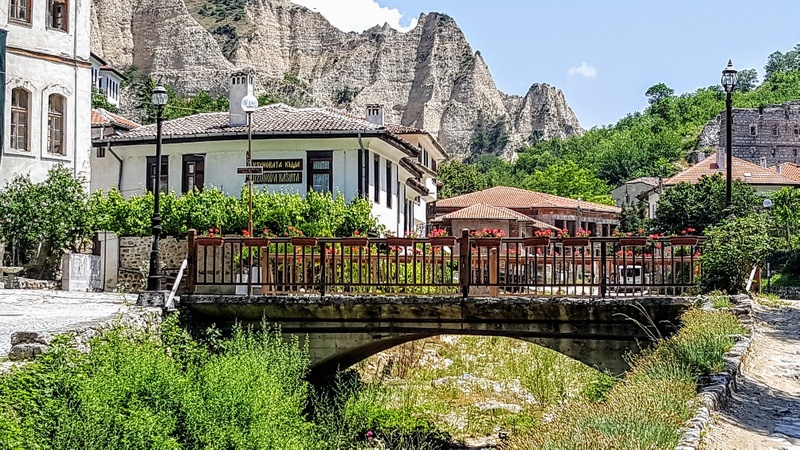 Melnik itself was charming and its architecture was nothing like we had seen in Greece. In fact, throughout our Greek leg, it was one of our biggest disappointments. So to see such rustic buildings built with dark oak and stone, with timbers reminiscent of England’s Tudor period, quaint bridges spanning across dry river-beds and the faint echo of Bulgarian folk music filling the air, was spirit-lifting. 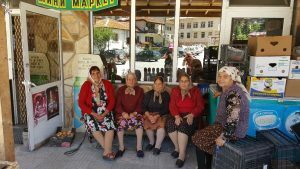 Great food, tasty, cheap wine blended with generous, warm-hearted locals and pretty landscape, soon revealed that we had nothing to fear. 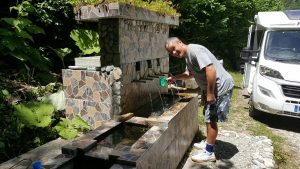 Except things were set to get even better as we moved eastwards into the Rhodope Mountains to escape the impending heatwave. A recommended location for hiking, natural wonders and stunning scenery seriously appealed to us as we wove our way across the windy, undulating landscape. Reunited with our convoy buddies we had wild camping on our minds. It didn’t take long for the mountains to build up in front of us and the pine forest to consume us with their heady scent. The Rhodopes are simply stunning and our breath was taken away as we meandered around each bend. It amazed us to see timber huts along the roadsides with canteen tables, fridges and outdoor ovens with natural springs offering refreshment to the workers quarrying for slate tiles and logging the trees. This earthy partnership gave us a real sense of community spirit and compassion. The Buynovo Gorge was our final resting spot that we would call home. 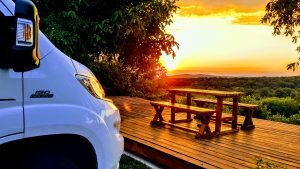 After a nerve-wracking journey through the gorge with dangerous overhangs and heart-stopping bends, and infrequent passing places for the two-way traffic, we were very happy to arrive. Staying in heart of the gorge, with the sound of the river crashing through the rocks and the sheer granite walls towering above us, made this a gorgeous spot to rest our heads. Tomorrow we would explore. Our dice with death, or so it felt! Yagodinska Cave is one of the hotspots of the area, although there are so few foreign visitors here, so you will only share it with locals. 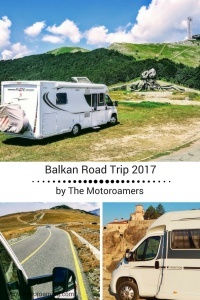 In fact, in the last ten days we’ve only seen four other motorhomes, and they were Bulgarian. The Cave tour, in Bulgarian of course, took us deep into the earth with great architecture to wow us. In truth, the Dragon’s Cave in Kastoria, Greece was more impressive, although again, trying letting go of our comparison eyes allowed us the chance to see it in all its own glory. 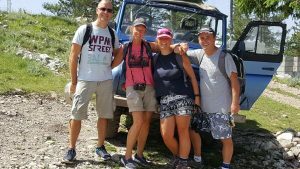 All along the gorge route you have the eager smiles of the Safari Jeep owners all keen to take your €5pp fee for the adrenaline ride of your life. The Eagle’s Eye view point is a popular hike, although finding a route was difficult so we resorted to the jeep ride. Well we were not expecting the bone jangling, body shaking ride that we got. Scared half to death, although perversely fun! Here’s the video we cobbled together through the rather bouncy journey. Our next stop was Trigrad Gorge, just across the valley. Whilst we felt a bit caved-out, you can never tire of the scenery presented before your eyes. 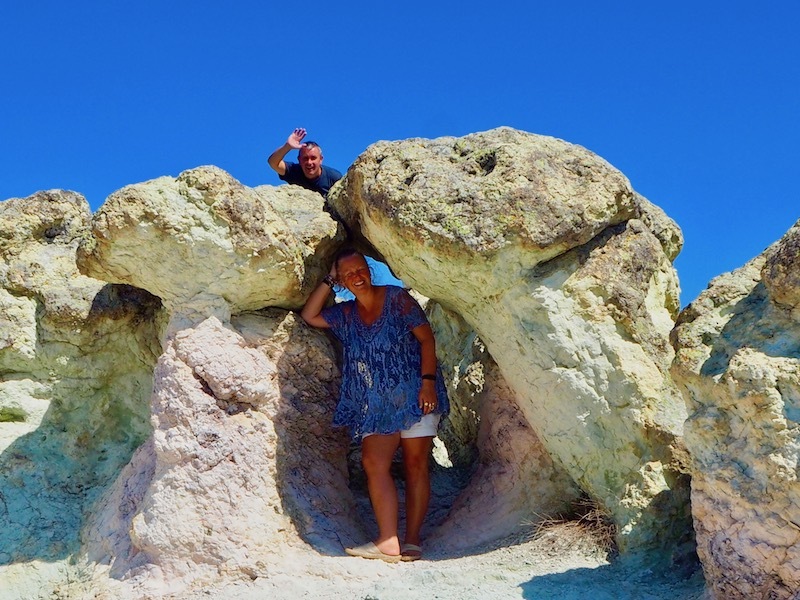 We found ourselves at a spot in Trigrad village for the night and took the walk down to the Devil’s Throat Cave. This offers visitors, for a mere €4.50, a sight of Europe’s highest underground waterfall, which has been traced by explorers for decades and they cannot find where the river exits the cave – it just disappears into the ether. The climb up 300 steps from the cave floor to the surface was a challenge, especially for Myles’ vertigo, although it was a totally different cave and always worth a visit. 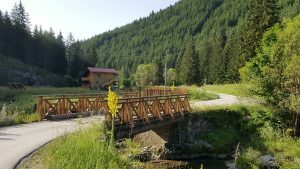 My first solo cycle up the Trigrad valley, really nailed the beauty of this country, as I passed orchids, saw eagles soaring up in the forest and farmers looking after their potato and spinach crops. Eventually I ran out of road and the pathway to the village with a dead-end was just left to rock and potholes. The village had probably never seen a cyclist before let alone a Brit, so I felt like I was entering a hidden world, untouched by commercialism. 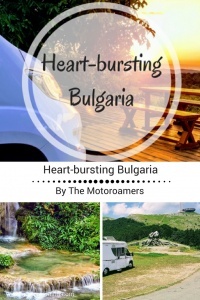 And that is my sense of this part of Bulgaria. There’s a real innocence and genuine simplicity about how the locals live their lives. They are not bothered by the internet going down or the latest gadget being released. They just care for their cattle, tend to their crops and make hay whilst the sunshines. How poignant a proverb that is for Bulgaria, as it seems all their efforts during summer are geared towards preparing for the harsh winter months. 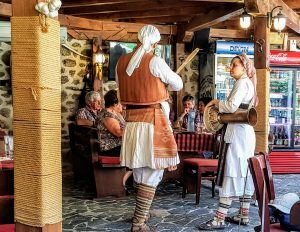 So our first 10 days in Bulgaria have been an immersion into a culture that is so different to any other country we have seen so far. Hard working men and women walk with curved spines from their toil in the fields, cow herders in their 90’s still work with an energy that I’m jealous of and everyone has a smile or a wave for you. We feel safe, welcomed and endeared to this alluring place and look forward to uncovering more of its charm.